Despire the fact we may have just seen the Samsung Galaxy Note 4 with a normal-looking screen, rumours of a wraparound display refuse to die. The latest hint of such a device comes in the form of a trademark for the Galaxy Note Edge, filed at the USPTO and found by galaxyclub.nl. There's absolutely no information on it other than the name, but the inclusion of the word 'Note' obviously means that it's intended to be part of the Note line, while the word 'Edge' might be a reference to the curved, edge-covering screen that a three-sided Note could have. Of course that's a whole lot of speculation, but this isn't the first time that we've come across the idea of a curved Note, so it's as good a guess as any. Even if that is the intention, a trademark is a long way from being a finished product, so the three-sided display may not show up until the Note 5. It's also worth noting that by calling it the Galaxy Note Edge rather than just the Galaxy Note 4 there's a suggestion that it might be a spin-off from the main range. 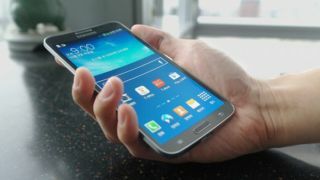 So we may get a normal, flat Galaxy Note 4 and then a deliciously odd Galaxy Note Edge alongside it, which is another rumour we've heard before and would make sense, as Samsung would be betting big on a curved screen to put it on every Galaxy Note 4. We should have some revelations as to what's going down in Samsung land soon enough, as the company wants us to 'Note' September 3. Whatever could that be about? Apple's iPhone 6 might come in a phablet flavour if you want a Note 4 alternative.